It ONLY took 31 hours to get home. Left Windhoek, Namibia, at 9am Monday, CDT, and arrived in Kansas City at 4pm on Tuesday. Changed planes in Johannesburg, Frankfurt, and Toronto. Here’s a map of the trip beginning on the right. The dates are written by each overnight location. The map doesn’t include South Africa so the first night is inside Botswana. Kassie was with me until the 11th when she had to return to the US. Our diesel cost was approximately $.75 per liter in Botswana…that’s roughly US$2.80 per gallon in Namibia it was approximately US$3.09. There aren’t many tarred roads in either country. There were two spares in each of the two trucks. Luckily, no flats. In Botswana there are “A” roads that are tarred. Others aren’t. Those are primarily gravel or rock. In the national parks in Botswana 4×4 is absolutely required. Those roads are deep ruts of loose sand. In Namibia, the best roads are “B” roads and there aren’t many of those. “C” and “D” roads are gravel or rock. On a “C” road you could usually drive 80kph and a “D” road the top speed you could drive was around 40kph and often had to slow down due to washboarding of the road. Again, luckily no flats. One can drive almost everywhere in Namibia with a 2-wheel drive vehicle. The roads in the national parks were all gravel but they were generally good roads that were about three lanes wide. Very dusty but easy to drive. 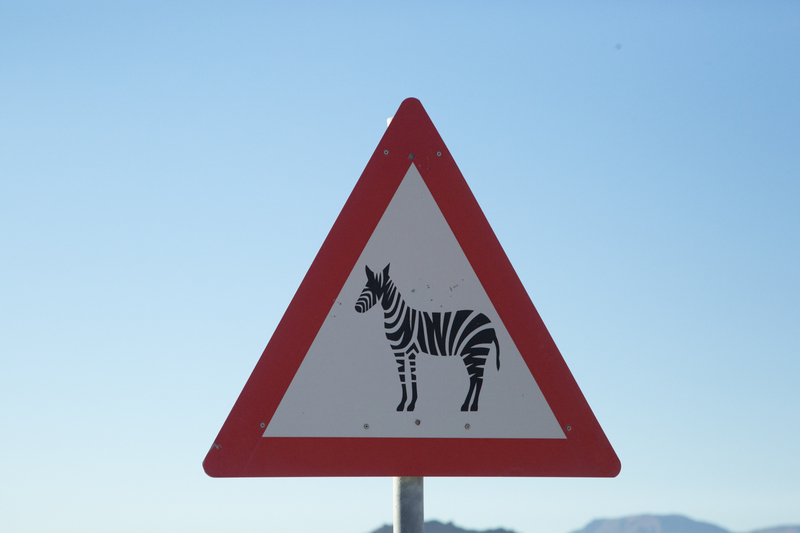 My biggest adjustment to driving in Africa wasn’t driving on the left side of the road. I picked that up pretty quickly although Kassie suggested a couple of times that I needed to swing a little wider making a turn to get to the “wrong” side of the road. My biggest adjustment was remembering that the turn signals are also reversed. They’re on the right and the windshield wipers are on the left. It took me two days before I had that mastered. Meanwhile, we cleaned the windshield every time we turned. One of the other little things I noted was the cancer warning on the cigarette packages. While on a cruise I noticed this pack of cigarettes belonging to our captain. That got the point across! 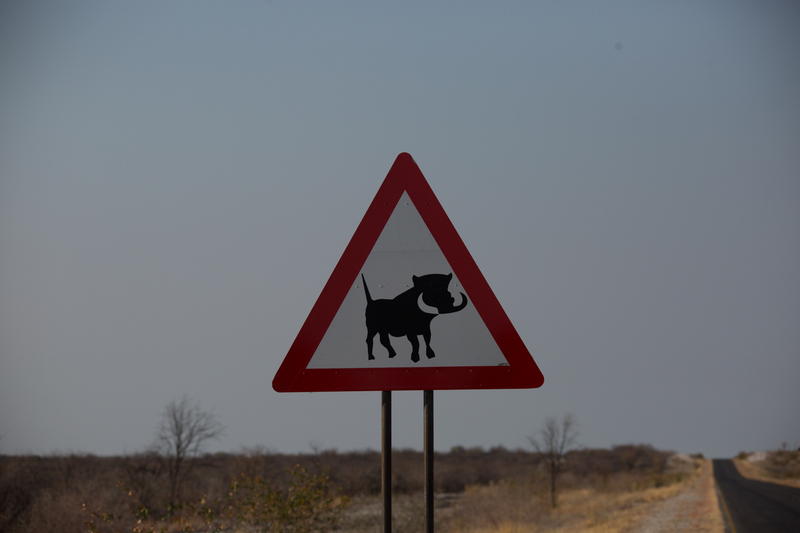 We also had to beware of wildlife crossing the road. It wasn’t uncommon to find cattle and goats grazing beside the road. And there were warning sides for them, too, but here are a few others we encountered. Gemsbok or Oryx depending on which country you were in. I’m home for two weeks then leave Oct. 20 for Santiago, Chile for one night. I’ll meet up with a group of about 100 photographers for my next trip. On Oct. 21 we’ll fly to the Falklands and board the Sea Spirit for our trip to South Georgia Island. The island has about 30 residents and is approximately 1000 miles straight east of the southern tip of Argentina in the middle of the Atlantic Ocean. I won’t have internet on this trip so I’ll do a blog or two once I get home. The primary wildlife here are hundreds of thousands of seven different kinds of penguins and elephant seals. We’ll also spend three days on different islands in the Falklands before ending our trip at the very southern end of Argentina on November 6. I get home on Monday, November 7th. I hope you’ve enjoyed this blog and the photos we’ve shared.